It’s the question that every curious baseball fan is wondering right now. What would have happened? What would have happened if Kansas City’s third base coach, Mike Jirschele, had sent Alex Gordon home with two outs in the bottom of the ninth inning in game seven of the World Series? San Francisco had already made two blunders on the play. Was another one imminent? Let’s look at this by numbers first. Brandon Crawford, the Giants’ shortstop, received the throw on a bounce about 150 feet from home plate at the time Gordon was scampering into third base. A clean transition and an on target throw would have surely beaten the runner. Gordon would have been dead by at least 15 feet. A bobble on the transition or an offline throw would have made for an interesting play at the plate, but the Giants had a little bit of extra time to play with. Was there a higher chance that Crawford make an error than the next batter record another base hit off Madison Bumgarner? Crawford’s fielding percentage this season was .971. That means 97% of the time there was an opportunity for him to mess up, he didn’t. The on-deck batter was Salvador Perez whose postseason batting average was just above .200. That’s not a high mark, but even still it means he recorded a hit in 20% of his postseason at bats. While it’s likely his chances go way down with Madison Bumgarner on the mound, remember it was Perez who had homered of the Giants’ ace in game one of the Series. Regardless, I still think the chance of another hit would be above 3%–Crawford’s error percentage. I stand with Jirschele’s decision to hold Gordon at third. However, had Gordon run home and the play happen at the plate, there is a chance the 2014 season would have had a more-than-ironic ending. And this is where two Marlins-related incidents could have changed the game. Flash back to May of 2011 when the Marlins were on a hot streak in San Francisco. The two squads were locked in a tie in the twelfth inning when young outfielder Scott Cousins tried his luck on scoring on a shallow fly ball. After catcher Buster Posey mishandled the hop, Cousins plowed right into him and scored the run. However, Posey’s missed the remainder of the season with a fractured fibula and torn ankle ligaments. This incident sparked much debate over whether or not collisions at home plate should be regulated further or banned. And thus became the new rule 7.13, which was instituted this season and provided more drama than it resolved. The rule is meant to protect catchers, but simultaneously gives very vague circumstances in which a catcher can occupy a the third baseline while receiving a throw from the field. Previously, a catcher was allowed to use his body to block the path to the plate while the throw came in, but the new rules state that he must leave a clear path unless he physically has the ball or the throw carries him into the baseline. But in the case that the catcher violates the rule and occupies the baseline without the ball, the runner shall be ruled safe even if he does not attempt to slide into home. That rule, plus the new replay additions for this year, caused runners to be ruled safe many times they never would have been in the past. Fast forward to July 31, 2014 when the Marlins were playing the Reds in Miami. With a 1-0 lead in the top of the eighth inning, the Marlins secured an inning-ending double play when Giancarlo Stanton caught a fly ball in right and threw home to nail the Reds’ runner by a solid ten feet. Great play, right? Wrong. The Reds called for a review, claiming catcher Jeff Mathis was in the baseline before he received the throw. Sure enough, a six minute plus challenge determined that Mathis was indeed out of line and the Reds were rewarded a run. This play was really the cherry on top of a long season of controversy over the new home plate rule, which effectively granted a team a run if the catcher at any point stood between third and home on a play regardless of how far the runner was from scoring on the grounds of “protection” for the catcher. As a result, Joe Torre, MLB’s Vice President of Baseball Operations, sent a memo to all the umpires and clubs explaining that if a runner would have been out regardless of the catcher’s position, he should not be deemed safe by review. However, this still left room for interpretation and controversy. Remember, all this was in place so that catchers could not be legally run into thanks to Scott Cousins and Buster Posey. Now let’s jump back to the World Series and wonder what would have happened had Gordon ran home and Crawford’s throw not been on time and on line. Well, it could have brought Buster Posey into the path of the runner. Posey could have accidentally blocked the plate out of instinct. The play could have been reviewed and forced the replay umpire to make an arbitrary decision over whether or not Posey was illegally in the pathway of the runner. Thus, it could have ended or extended the World Series by a process that brought more distress to the baseball world in 2014 than the looming return of Alex Rodriguez. Has anyone mentioned that if Alex Gordon had been sent home in the 9th, Game 7 of the World Series could have come down to a Rule 7.13 call? The latter is what I would have hoped for. Not because I wanted to see the Royals or Giants go out like that, but because it would have been a major insult the the already-injured baseball replay industry. And it likely would have sparked significant enough outrage to bring about lengthy off season discussions. And a major modification to the home plate rule would likely bring moral justice to Jeff Mathis, and uphold the excitement and legitimacy of physical plays at the plate for which Scott Cousins received all to much scrutiny. 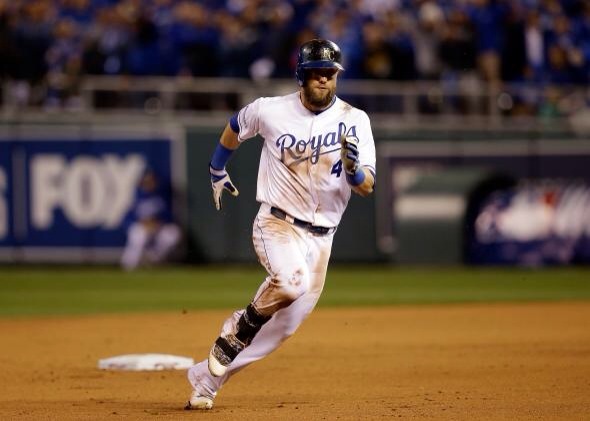 Chances are, Alex Gordon would have been a dead duck and San Francisco would still be World Series champions. But we have to wonder what if. And this is the role that the Cincinnati Reds, Buster Posey, and two lowly Marlins could have played in saving the Royals’ season.